The long awaited Ndebele/Zulu novel Igazi Labafo is now available to download as an e-book on the popular book selling website Smashwords. The process is simple and safe. One needs to visit smashwords.com and search for Igazi Labafo. Igazi Labafo is a novel that depicts how individual characters can be shaped by the environment they find themselves in. It furthermore highlights how an insatiable appetite for money can lead to an individual's demise. Written in dominantly Nguni, the novel tracks the life of Mpundule, a character who is a victim of stereotyping and tribal prejudice who finds himself trapped in a system with no leniency. On arrival in Johannesburg, he finds himself fighting for survival. Fateful circumstances become a factor for him joining a Mafia style criminal gang, and, in this vicious circle, he discovers that no matter how fast he can run his life, he just cannot hide from predestination - a typical tragic hero. The book starts by highlighting a picture of the disagreeable political after-effects still hanging in the minds of the Sigangatsha community of Kezi. As the protagonist, Mpundule, arrives from Mashonaland, with his mother and siblings in the area, he is scrutinized as an outcast and undesirable element, umhlobo ongelondwa nhlanyelo. This is because the event serves as a reminder to the harsh realities of the yester years and this is not a warm reception for the young Mpundule. Due to its writing style, Igazi labafo is indeed a good read. In the novel Ncube raises a number of provocative questions and constantly engages the reader in conversation causing the reader to take a new look at his own ideas and perceptions of life in general. Noma nje umhlaba uvele uhlaba, umuntu yinyamazana eyadalwa yathanda ukubana ihlale isenjabulweni ngaso sonke isikhathi. Noma umumo ungajika utshise kubebomvu phansi laphezulu, imvelo yenyamazana engumuntu iyazama ukuphendla phakathi kweyezi elimnyama, ebubini lasebuhlungwini izama ukufinyelela lapho okulobuhle lobunandi khona.Yikho phakathi kwezidalwa zonke ezikhona emagumbini amane omhlaba, umuntu yilona isela elikhulu. This is evidence of Ncube managing to wed originality of technique with depth of insight or breadth of knowledge or charm and technical innovation and makes Igazi Labafo a memorable foundation novel to future novelists. The novel has a good hook to the reader through the careful selection of Nguni diction. Ncube brings the characters to life in a remarkable way and make them visual and realistic. The novel constantly engages the reader as Ncube brilliantly uses good techniques to make readers root or be worried for particular characters; Ma bengamthola bangamginya ephila njengamaganyane impela. Into nje ayesuke wangayibuzi elangeni yikuthi angabe ekuphi lawo maganyane ngalesisikhathi. Impendulo ayengayazi yena yikuthi ayemi budebuduze lalapho ayemi khona. The author employs a writing style that sometimes reveals his personality or voice, but this helps tell us how he sees the audience of the novel Igazi Labafo. Often uproariously funny, the novel is a biting realistic presentation of the plight of Zimbabweans, particularly Matabeleland, youngsters who are victims of a system that leaves them with no option than to 'finish' their 'education' and ultimately head South; 'Sikwenzela five tiger kuphela mineri. Die deng iyabiza nawe uyaqava my topiza. Bhek' ilabeli yiJVC,' kwatsho omunye. 'Hayi kabi bafana bami, kodwa angiwuphethe neze ufifty rand namhlanje. Kodwa ngotwenty rand kungahlangana bafana bami,' sekuphendula lelihuzu. 'Eish yivari my bro. Awusheshe, uyazi musi, abohata bagcwele kulendawo,' kuphendula omunye wababili. 'Hayi bafana bami. Nani nivele niyazi musi, sisebenza sonke. Mara ma senithi kum' fifty randi seniyangibulala manje yazi?' Lihuzu lelo. The language of Igazi Labafo target contemporary and modern readers who have outpaced the language of the dominant 1970s Ndebele/Zulu novels. The writing style reveals the choices the author makes in syntactical structures, diction, and figures of thought. Similar questions of style exist in the choices of expressive possibilities in speech. We notice a deliberate use of connotations involving selection of a word to convey more than its dictionary meaning; Okukhulu akulamkhosi! Phela ukulandelana kwalezimota zisedlula lapha koMazinyane kwabakhumbuza mnyakana ibutho lembolisamahlanga lifikayo kulesisigodi. The language use makes Igazi Labafo best be defined as a Nguni novel. Nguni languages include Zulu, Xhosa, Ndebele and Swati. Because the Nguni languages are closely related, and in many instances different languages but mutually intelligible; Ncube uses them interchanging through the deliberate interaction amongst characters from these backgrounds. In this way, Ncube makes more visible the fact that Nguni languages might better be construed as a dialect continuum than as a cluster of separate languages. 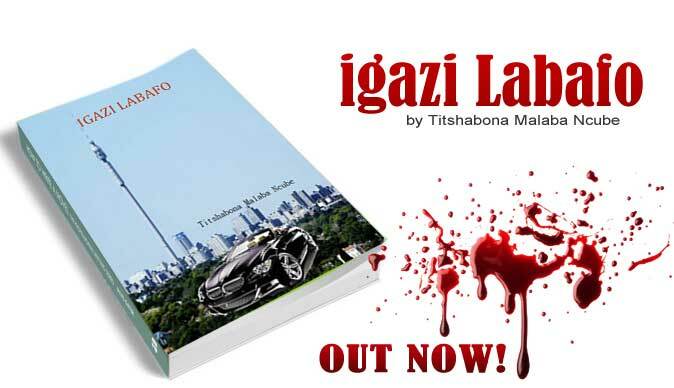 The author of Igazi Labafo was born Titshabona Malaba Ncube, in a closely knit family, comprising 4 boys and 2 girls, in the Sigangatsha area of Kezi. Mr Ncube began his schooling days at St. Sebastian Primary School where he spent his entire primary education career. He then proceeded to Regina Mundi Sec. School, Gwaai, where he completed his O Levels. In 1991 Mr Ncube advanced to Matopo High School for A Levels, and also got involved with the unforgettable church choir dubbed the Commissioned Brothers. In 1993 he progressed to the University of Zimbabwe and then deployed to JZ Moyo High School in West Nicholson as an A Level teacher. In 1999 Mr Ncube became the school sports master. As a consequence of his unquestionable passion for sports, especially football, he was appointed head coach for senior boys football team when his glamorous team went on to be adjudged the most disciplined team for the year 2000 in the then Peter Ndlovu Tournament. It was in the end of the same year that Mr Ncube migrated to the UK where he obtained an Honours Degree in Town Planning, and a post graduate Diploma, specialising in Planning Law. Mr Ncube is currently involved in several projects including being a song writer, author, town planner, and a dj on Afrodeepradio.com, an entertainment internet radio station based in the London.